Skeleton programming is an approach where an application is written with the help of skeletons. A skeleton is a pre-defined, generic component such as map, reduce, scan, farm, pipeline etc. that implements a common specific pattern of computation and data dependence, and that can be customized with (sequential) user-defined code parameters. Skeletons provide a high degree of abstraction and portability with a quasi-sequential programming interface, as their implementations encapsulate all low-level and platform-specific details such as parallelization, synchronization, communication, memory management, accelerator usage and other optimizations. SkePU is an open-source skeleton programming framework for multicore CPUs and multi-GPU systems. It is a C++ template library with six data-parallel and one task-parallel skeletons, two generic container types, and support for execution on multi-GPU systems both with CUDA and OpenCL. 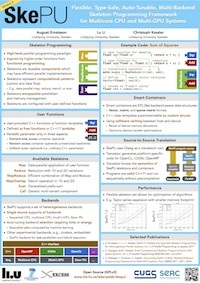 Map: Data-parallel element-wise application of a function with arbitrary arity. Reduce: Reduction with 1D and 2D variations. MapReduce: Efficient nesting of Map and Reduce. MapOverlap: Stencil operation in 1D and 2D. Each skeleton has several different backends (implementations): for sequential C, OpenMP, OpenCL, CUDA, and multi-GPU OpenCL and CUDA. There is also an experimental back-end for MPI (which is not part of the public distribution below). Depending on a skeleton call's execution context properties (usually, operand size), different backends (skeleton implementations) for different execution unit types will be more efficient than others. SkePU provides a tuning framework that allows it to automatically select the expected fastest implementation variant at each skeleton call. For passing operands to skeleton calls: Smart containers are runtime data structures wrapping operand data that control software caching of operand elements by automatically keeping track of the valid copies of their element data and their memory locations. Smart containers can, at runtime, automatically optimize communication, perform memory management, and synchronize asynchronous skeleton calls driven by operand data flow. 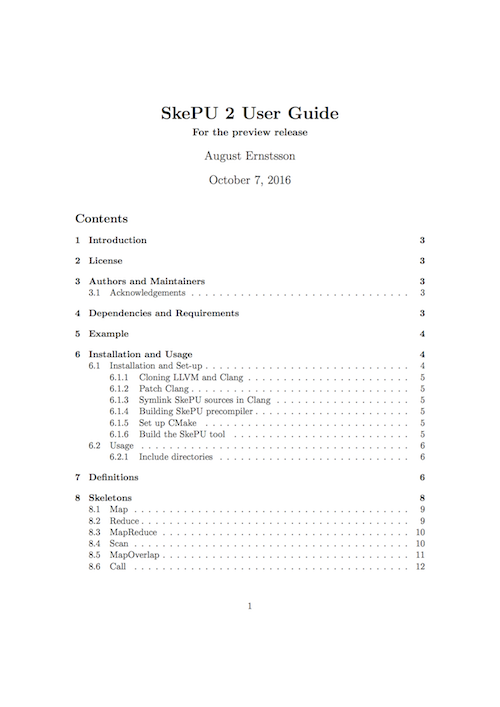 SkePU 2 is a rewrite of SkePU, with a new user interface based on modern C++ syntax, such as lambda expressions; a new compilation model with a source-to-source translator using Clang libraries; a revised implementation and runtime built around variadic templates; and the same efficient parallel skeleton algorithms as before. 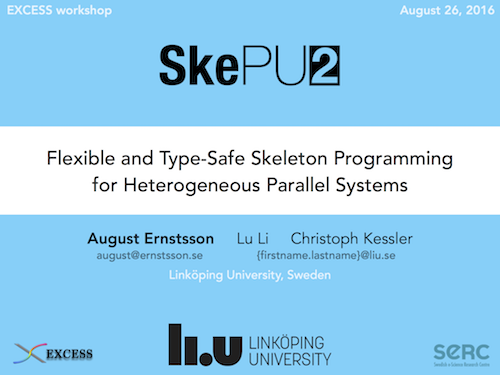 The design of SkePU 2 emphasizes flexibility and type-safety, areas in which earlier work on SkePU 1.x had identified opportunities for improvement. SkePU 2 removes the MapArray and Generate skeletons in favor of a generalized Map and adds the Call skeleton. It is not backwards-compatible with programs written for SkePU 1.x. However, translating existing source-code is straightforward as each skeleton in SkePU 1.x has a direct—or simpler—equivalent in SkePU 2. More information on older SkePU versions is available here. SkePU requires a target compiler compatible with the C++11 standard (or later). Additionally, a system able to both compile and run the LLVM system, including Clang, is required (this needs not to be the target system). SkePU is tested with GCC 4.9+ on Linux and macOS, Apple LLVM (Clang) 8.0 on macOS. CUDA backend requires CUDA (version 7 or later) compiler and runtime, and hardware support. OpenCL backend requires an OpenCL runtime and hardware support. OpenMP backend requires an OpenMP-enabled compiler (e.g., GCC). This example demonstrates SkePU with a program computing the PPMCC coefficient of two vectors. 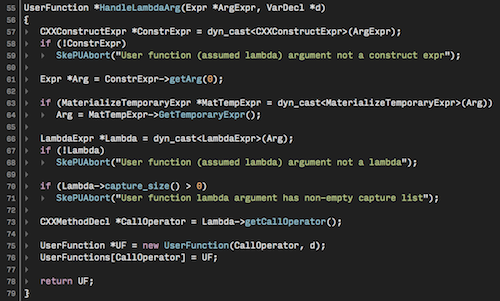 It uses three skeleton instances: sum, sumSquare, and dotProduct and illustrates multiple ways of defining user functions. SkePU's smart containers are well suited to calling multiple skeletons in sequence as done here. SkePU contains the skeletons Map, Reduce, MapReduce, MapOverlap, Scan, and Call. They are presented separately below, with a short program snippet exemplifying their usage. In practice, repeatedly calling skeletons and using multiple types of skeletons is encouraged, to fully utilize the advantages of SkePU such as the smart containers. The Map skeleton represents a flat, data-parallel computation without dependencies. Each sub-computation is an application of the user function supplied to the Map. It works on SkePU containers by, element for element, applying the user function (sum in the example below) multiple times. Any number of equally sized containers can be supplied as arguments; Map will pass one element from each. For more general computations, it is also possible to supply extra arguments as needed which can be accessed freely inside the user function. These can be containers or scalar values. Map can also be used without element-wise arguments, with the number of sub-computations controlled by the size of the output container only . Programs can take advantage of this, and the fact that the user function can be made aware of the index of the currently processed element, to create interesting use-cases. See, for example, the Mandelbrot program in the distribution. Reduce performs an associative reduction. Two modes are available: 1D reduction and 2D reduction. An instance of the former type accepts a vector or a matrix, producing a scalar or a vector respectively as the result; the latter only works on matrices. For matrix reductions, the primary direction of the reduction (row-first or column-first) can be controlled. MapReduce is a sequence of Map and Reduce and offers the features of both, with some limitations, for example only 1D reductions are supported. An instance is created from two user functions, one for mapping and one for reducing. The reduce function should be associative. As with Map, the possbilities of zero element-wise arity and element-index awarneness in the user function create interesting possibilities. The Taylor program in the distribution uses this to perform Taylor series approximations with zero data movement overhead. A more typical dot product computation is used in the example below. Scan performs a generalized prefix sum operation, either inclusive or exclusive. MapOverlap represents a stencil operation. It is similar to Map, but instead of a single element, a region of elements is available in the user function. The region is passed as a pointer to the center element, so manual pointer arithmetic is required to access the data. A MapOverlap can either be one-dimensional, working on vectors or matrices (separable computations only) or two-dimensional for matrices. The type is set per-instance and deduced from the user function. Different edge handling modes are available, such as overlapping or clamping. The source code for some of these is included in the SkePU distribution. Auto-tuning SkePU: A Multi-Backend Skeleton Programming Framework for Multi-GPU Systems. Int. 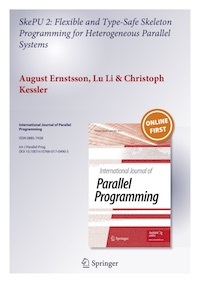 Journal of Parallel Programming 44(3):506-530, June 2016 (online: March 2015), Springer.DOI: 10.1007/s10766-015-0357-6. For reporting feature suggestions, bug reports, and other comments: please email to "<firstname> DOT <lastname> AT liu DOT se". This work was partly funded by the EU FP7 projects PEPPHER and EXCESS, by SeRC project OpCoReS, and by CUGS. Previous major contributors to SkePU include Johan Enmyren and Usman Dastgeer. The multivector container for MapArray (note: obsolete in SkePU 2), and the SkePU 1.2 user guide have been added by Oskar Sjöström.